To unite the Egg Poacher and Brunch Hunter clans, a suitably smart breakfast venue was required – up stepped Salt Cafe in the heart of leafy Morningside. The stretch of shops along the main road haven’t always fared well, but Salt seems set to stay, offering excellent coffee and a simple brunch and lunch menu for the well-heeled masses. Inside the interiors take a nautical theme, with great hulls from old rowing boats on the walls, a central bar of wood and metal, and great rolls of brown paper listing the daily specials. Bulbs are fashionably exposed, tables neat and hewn from burnished metal, all built to seat a reasonable number of covers for a relatively small space. Staff are few and very friendly, quick to deliver an excellent flat white while menus are perused. For brunch the offerings are reassuringly familiar: Eggs Benedict, Florentine and Royale, granola, a selection of pastries – and there are daily smoothies, milkshakes and wicked sounding breakfast cocktails to clear the weekend’s fog away. There are local sausages, Scottish fruits and beers from nearby breweries; flavours are fresh and perfectly seasoned. Salt was doing a roaring trade on a Thursday morning so will fill up fast at weekends. Head there early (brunch starts at the very reasonable 10am) and grab a table by the window to watch the day trundle by. 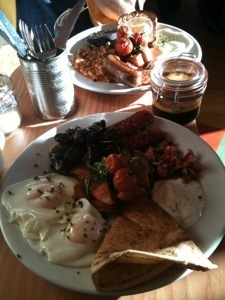 Price: from £5 (granola) to £9.95 (full Scottish breakfast). There are some mornings where it’s perfectly necessary to hunt out booze at breakfast time. Our heads foggy from last nights’ festivities we wandered the lanes of Brighton, navigating a warren of retro emporiums, free-range market vendors and psychedelic postcard shops to find ourselves, at last, at the sea. Greeted by the somewhat sinister scene of the burnt-out pier with a backdrop of brooding storm clouds, we made haste towards The New Club, a diner with a reputation for encouraging drinking way before the watershed. There is food too, of course. 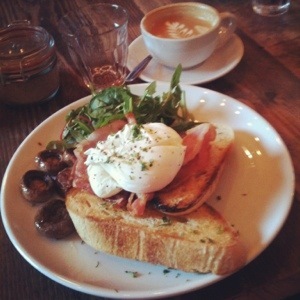 For those able to get out of bed before 2pm they have a robust brunch menu with a heavy emphasis on reconstituted pig. Brilliantly, bacon features just about everywhere: atop their infamous ‘dirty burgers’ and even in the booze. For The New Club is the home of the ‘Breakfast Club’, a pig-infused Bloody Mary with pickles and their own special spicy sauce thrown in for good measure. This is not for those who think tomatoes are meant for pasta sauce and pizzas; in all honesty, it spoke a little too much of passata for my taste, too. But the bacon-infused vodka is a stroke of genius, and those who enjoy a Bloody Mary or Caesar will be happy here. For those of a more delicate disposition, there’s a host of other brunch cocktails with enough liquor to stave off any two-day hangover (my Kentucky fizz – Woodford Reserve bourbon, Prosecco & fresh mint – was divine). 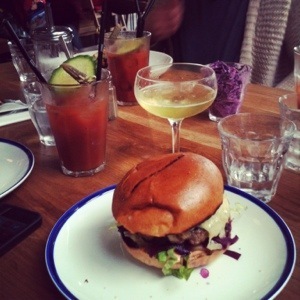 If you need something to soak up the liquor, aim to get their before the lunch menu kicks in. Their warm pretzels with salted caramel and buttermilk pancakes (with, you guessed it, maple bacon) have had good reviews but their burgers were a little tasteless and heavy on the condiments. Then again, two cocktails in and you’ll just about forgive anything. Price: from £2.50 (toast & jam) to £9 (full breakfast). Cocktails from £7 (Bloody Mary). The breakfast stars have aligned over Stokes Croft. The Bristolian has been a familiar sight in Picton Street for years, though its once grubby interior has had a spit and polish and it’s come up shining: on a sunny Saturday the pine floors, bright lanterns and fairylights make the place the feel like the inside of one giant toy box. And it’s full of good food. The Bristolian is the best of what this city represents – all are welcome, from St Andrew’s poi performers to dads on the morning shift, freelance parents with free-range toddlers and last night’s casualties, invited in from the walk of shame and offered a sympathetic ear and a constant supply of coffee. In fact, this place is the perfect hangover cure, with Bloody Mary and her mates making an appearance, as well as an impressive breakfast menu that will suit all appetites. Top of the list is the Bristolian Fusion, a Mediterranean delight full of deliciously spiced chorizo, salsa and fried potatoes; their full English is a carnivore’s dream with their bacon and sausages declared the best ever by the Egg Poacher – praise indeed. This microcosm of Montpelier comes with all the extra options you’d expect – vegan and vegetarian, soya milk and super salads; there’s bread for sale from the wonderful Hobbs Bakery, home-baked cakes, proper leaf teas and a full-bodied coffee. Get here early to avoid the rush – by 11 most of the ‘Croft residents are awake and ready to descend on the tightly packed tables. But it’s worth the squeeze – this counts as one of the best breakfasts yet. Price: From £3.50 (muesli & yoghurt) to £7.95 (Bristol Fusion).